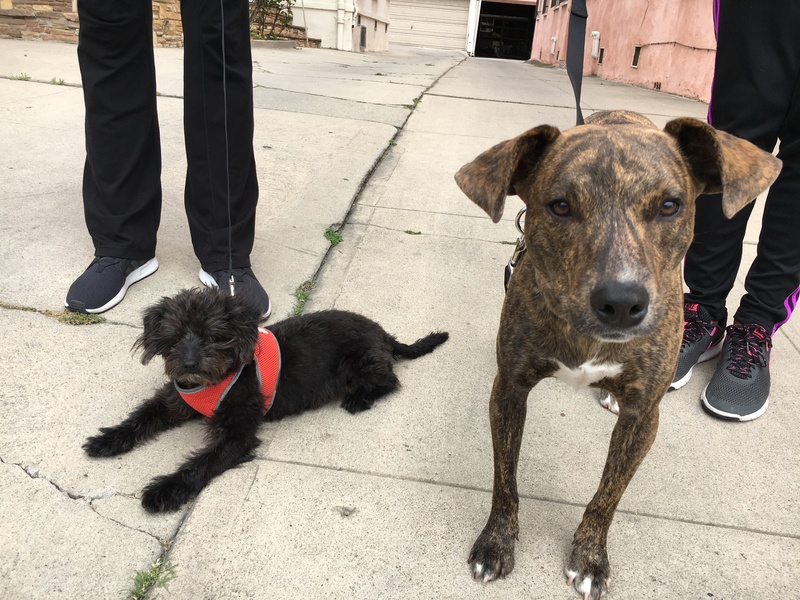 Oliver is a six-year-old Schnoodle who recently welcomed one-year-old Greyhound / Basenji mix Spike into his home in the Melrose district of Los Angeles. I was called in to primarily work with Oliver and get him to stop attacking Spike when guests arrive and dominating him around food and some other high value items. The dogs were adopted by two sisters who live next door to each other in a duplex. So while the dogs technically belong to separate humans, they take turns watching them and the dogs are together most of the time. When I arrived for the session, Oliver met me at the door and Spike stayed away. I learned that Oliver had gone after Spike earlier in the day and as a result, Spike was more reticent that usual during the arrival. Even though Spike is several times larger than Oliver, the older dog was clearly the dominant presence. Part of this is due to Oliver’s age and experience. Additional factor is that Spike is a sensitive dog who is somewhat submissive. Because he was a former street dog rescued from Costa Rica, there could have been experiences that caused his to have lower self esteem or display submissive behavior. I spent a good portion of the session going over small changes the guardians can make to the dog’s daily lives. There really wasn’t much structure in place and this can be contributing to the unwanted dog behavior issues. If we do not consistently correct or reward our dogs, they can get the impression that we are all peers. If a dog sees you as a peer, then listening to you becomes optional. It can also cause the dog to think it needs to fend for itself. This likely caused Oliver to become more aggressive when Spike arrived and could also cause the new dog Spike to become more submissive. As a dog behaviorist, a big part of my job is pointing out what people do to confuse their dog or send the wrong message. After pointing a lot of these things out, making a lot of dog training tips and sharing some dog behavior advice, I went over the warning signs that Oliver is going to use before he goes after Spike. You can watch this video on dog communication and warning signs in the video below. Most dog fights don’t appear out of the blue. There is almost always a reason and warning or a communication exchange before the fight starts. Knowing how to read dog body language and what to look for can allow the humans to disagree with Oliver before he goes after Spike. Stopping a dog fight from happening is much better than breaking them up. Because Oliver often goes after Spike when people arrive, it tells me that his guardians need to help him develop more self control. There are many ways to achieve this through positive dog training and behavior modification. A great way to do this is training the dog tricks and commands that require the dog to control itself; like training a dog to stay. I also went over how the guardians can break down an activity where the dog displays an unwanted behavior into a training scenario. By isolating the individual steps of an activity, we can train a dog to behave how we want for that step. By practicing that step over and over, and not moving onto the next step until the dog knows how we want them to behave, we can teach them to behave in a different way. If the guardians continue to have difficulty with Oliver going after Spike when guests arrive, they can search “door exercise” on the Dog Gone Problems website and find free dog training videos where I show clients how to break down the door answering ritual into these individual steps. We wrapped up the session by filming the dog’s roadmap to success. You can watch this free dog training video by clicking below.